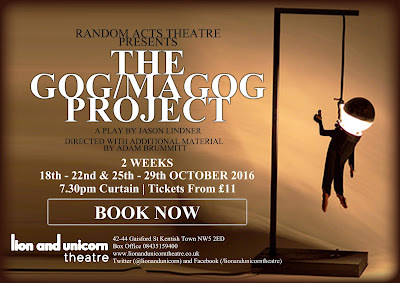 Critically acclaimed “The Gog/Magog Project” makes its London debut! Successful productions in L.A., NYC, Chicago, and Exeter have all touted the legend of Gog. This bold and daring project is based on the mysterious demise of performance artist Alexander Gog, an event still shrouded in rumour and supposition and due to ongoing legal considerations must be presented as a work of fiction. So begins the dark comedy that is The Gog/Magog Project, a searing social commentary and exploration of the nature of artistic expression that chronicles the fifteen-year incarceration of Alexander Gog. More than a decade ago, Alexander Gog embarked on a radical experiment, caging himself in a theatre and delivering nightly performances from his cell for a period of one year as part of The Gog/Magog Project. Tragically, what was meant to be one year has become fifteen, with Gog moved from venue to venue, country to country, and made to survive on a diet of The Daily Telegraph and Banana-Flavoured ‘Moon Pies’. Now, London plays host to this extraordinary show for the first time. From behind the bars of his home, Gog takes audiences with him in a virtuoso performance which is as unnerving as it is hilarious.